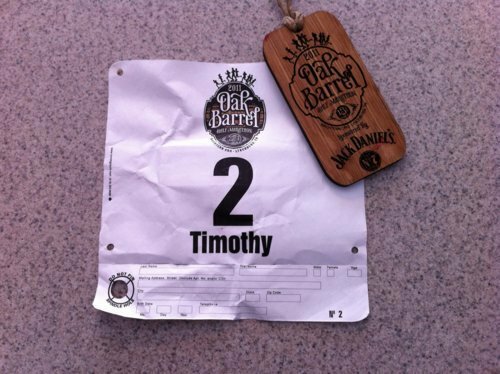 My Run: Overall, the Oak Barrel Half Marathon in Lynchburg was my seventh half marathon. This race was capped at 1000 entries, and there were just under 900 that made it to the finish line. I went into this race with a lot of uncertainty about how hard I could push myself. 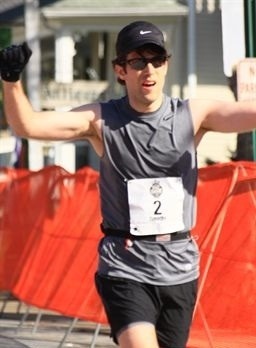 During the fall and winter, I ran four marathons and one half marathon in a five month span. 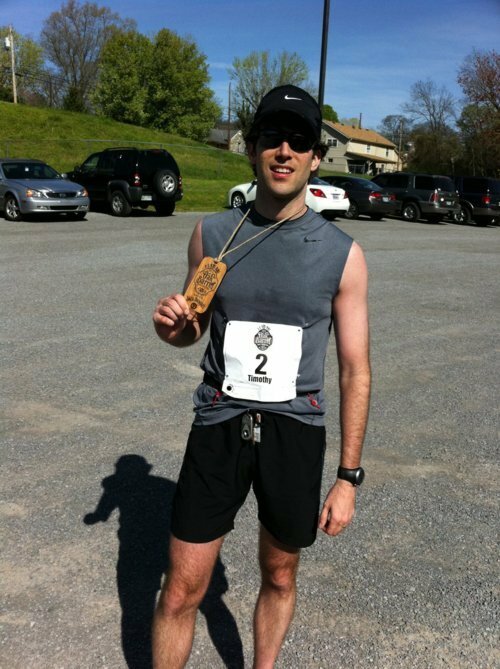 At the Murfreesboro “Middle Half” marathon in October, I set a new PR of 1:31 (6:57 pace). After completing the Mercedes Marathon in February, my body was pretty trashed and I decided to re-evaluate my training plan and race schedule. This included a re-commitment to P90X/Insanity, and not scheduling another marathon until October. In Mid-March, I began feeling like my old self again in track workouts and long weekend runs. However, during the last full week of March, I went on a mission trip to southern Honduras, and was only able to run 10 miles while gone. Also, we were only supposed to be there for 8 days, and ended up staying for 11 due to travel difficulties. Because of this I was only able to run 18-total miles during the two weeks leading up to the Oak Barrel Half. On top of this, I came down with a cold the day before the race. With all of this in mind, I decided to start the race off pretty conservatively, and then take the rest based on how I felt. I traveled to the race with my friend and track coach, John Thorpe. John had completed the Oak Barrel in 2010, and was able to give me some pointers on dealing with the course. I knew that the course was famous for a very difficult incline during mile five called “Whiskey Hill.” John said that I should plan on losing one to two minutes off my pace during that mile, and then I should take another quarter for recovery after cresting the hill. He said that if I pushed any harder, I risked running out of gas for the rest of the race. 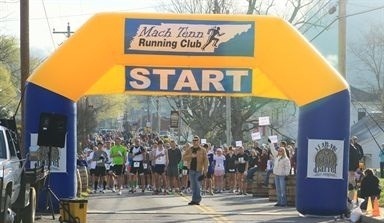 Weather conditions were absolutely perfect, with temps in the low 40s at the start and around 60 at the finish. I started off the race at just over 7:00 per mile pace, and ran the first 4 miles at a 7:11 average pace. As I began the initial part of “Whiskey Hill” at the start of mile 5, my pace slowed to 7:30. However, during the second half of mile 5, “Whiskey Hill” presented an exponentially greater challenge as it is one of the steepest grades I have ever tried to run. Many of the runners around me began to walk, but I was determined to keep pushing through, even though I felt like I was running in place. I was confident that my total time for mile 5 would be between 9 and 10 minutes. With that in mind, I was quite pleased that I completed my 5th mile in 8:35. However, just as John had told me, I was spent! I continued to run at a reduced pace for the next quarter mile before attempting to pick up the pace again. Even though my legs were feeling better, I was still not able to push my pace back up to where I was before “Whiskey Hill.” My average pace for miles 6 through 8 was 7:20, and my overall average after mile 8 was 7:25. As I crossed the 8 mile marker, I started to get mad, because I knew that I had more in me than I was giving out to that point. I also knew there were some downhill sections coming up, so I decided I was going to pick up the pace and attempt to run a sub 7:00 minute mile. I finished mile 9 in 6:53, and felt really good. Other than 2 runners about 100 yards ahead of me, I was essentially running by myself. As I crossed the 12 mile marker, I tried to kick it up another notch and catch the 2 runners ahead of me. To their credit, they also picked up their pace, and I was unable to match them. Regardless, my average pace for the final 5 miles was 6:55, and I crossed the finish line in 1:34:46. While this was 3:46 off of my PR, I was still extremely pleased due to my lack of prep during the prior two weeks and the difficulty of the course. This time was good enough for 24th overall and 4th in my age division. I mentioned earlier that I traveled down to Lynchburg with John Thorpe. Well, John finished the race in 1:20:00, which was 2nd place overall. This is a 6:07 average pace, and he did the last 6 miles at a sub 6 minute pace! Very impressive, and I’m very happy for him. There were 6 aid stations on the course. 5 of these had both water and Gatorade. The volunteers at the aid stations were fantastic about calling out exactly what they were holding. At the finish, there is plenty of room to keep moving. After receiving your medal, all finishers had access to a post-race food including pizza, bananas, oranges, cookies, bottled water, and Gatorade. Another couple of nice features include disposable timing system that is built-in to the bib. Also, all of the bibs include the runner’s first name, which ultimately leads to the crowd cheering for you by calling out your name. All participants received a New Balance technical, long-sleeved T-Shirt (really nice and gender specific), a running hat, and a nice shoe bag. 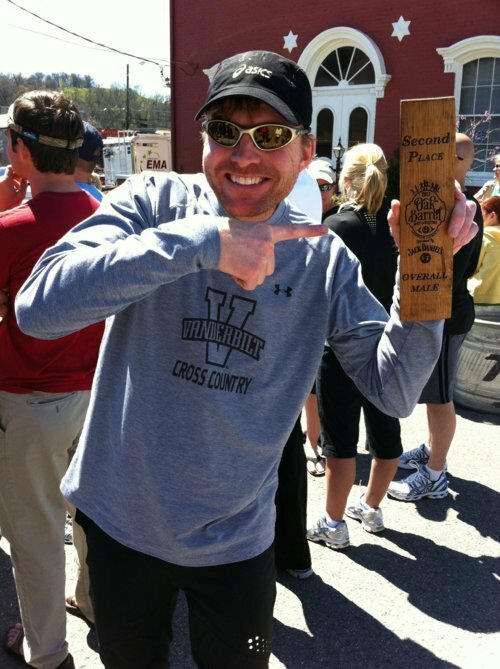 The finisher’s “medal” is extremely unique as it is made out of the wood from an oak barrel. There is ample, free parking close to the start line and lots of port-a-potties. The Course: The course starts just off the square, and heads in a loop through the country country, over a ridge, and then back into Lynchburg. It is a beautiful course that is a lot of fun to run, however it is also very challenging. The first 4 miles contain rolling hills with very few flat areas. Mile 5 is “Whiskey Hill,” which starts off as a fairly gradual include, and then becomes extremely steep at the end. After mile 5, the course again begins to roll. Beginning at mile 9, there are several sharp downhills, some of which put quite a strain on the quads. 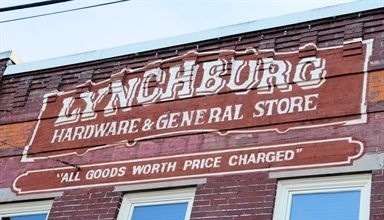 The final mile turns back onto the main highway toward Lynchburg. The finish is on the square which is pretty cool. I plan to make this an annual event, as long as I don’t have a marathon conflict. This is a great race!